Tarpon Flats is located just 60 miles south of Miami, Florida on the beautiful island of Key Largo in the sunny Florida Keys. Standing on our shoreline you have a magnificent panoramic view of Largo Sound and the rising sun. In season watch tarpon roll within yards of our private sandy beach area. Our marina can accommodate your boat if desired, or let us plan your day on the water with one of our professional guides who can take you for a day of fishing or fun. Just steps from your door, board a state of the art flats or off-shore boat. Tarpon Flats is within minutes of the famous Bonefish Flats of Key Largo, Florida. The Back Country of Florida Bay and the spectacular Atlantic Ocean. These waters abound with Bonefish, Snook, Tarpon, Redfish, Dolphin, Marlin, Sailfish, Wahoo and Tuna, all awaiting your tantalizing fly. Jump into one of our kayaks with your fishing rod and paddle east across the Sound to our very own bonefish flat on board Twice Bitten with Captain Jim Mulcahy. He will have you fishing the blue waters of the Gulfstream catching Dolphin, Tuna and Sailfish. Our back country guides can zip you through Adam's cut, just 5 minutes from Tarpon Flats, the gateway to the back country and Flamingo. In no time you will be matching wits with the likes of Trout, Redfish, Bonefish and Snook. Come to Tarpon Flats for a fabulous fishing vacation in the Florida Keys. Not particularly interested in fishing? Not to worry, there will be plenty to do. We can book you on a snorkel or dive trip to our fabulous coral reefs, a day swimming with the dolphins or sunbathe and relax your cares away in the lush tropical setting of Tarpon Flats. Click on island links for a listing of nearby shopping and attractions, to make your Florida Keys vacations complete. Tucked away amongst towering coconut palm trees and snow white sand beaches of beautiful Key Largo, Florida is Tarpon Flats, a fly fishing inn, marina, outfitters and conch house in the Florida Keys. Tarpon Flats, once an old fish camp, has been painstakingly restored by the owners. You round a corner on the road from U.S.1 and there it is, overlooking beautiful Largo Sound, harkening back to the days of Olde Key West or a secluded tropical Island in the Colonial British Empire. Fishing around Tarpon Flats is a good today as it was then. In the morning, resident guides leave from the docks, a few steps from your door, cruising past the white sand beach and hammock hung beneath the whispering caesarian tree. In no time at all you can be fishing the brilliant blue gulf stream waters for dolphin, wahoo, marlin, sailfish or tuna or head west through Adams Waterway to the back country of Florida Bay. The Everglades, Flamingo and Cape Sable are only a 45 minute run for those who know the waters. Not into fishing that's ok At Tarpon Flats we can also accommodate your romantic weekend, evening or maybe even your honeymoon. Our beautifully decorated rooms have everything you need for a quiet evening for two. Maybe it's a family vacation Tarpon Flats we can arrange for an educational and fun eco-tour of the everglades or the backwaters of Key Largo. A day of scuba diving or snorkeling. It's all up to you, at Tarpon Flats your wish is our command. Our Manager, Carol Rodgers, a twenty year resident of Key Largo, co-directed the restoration. It has been a labor of love for her and she will be sure to make your stay at Tarpon Flats memorable. 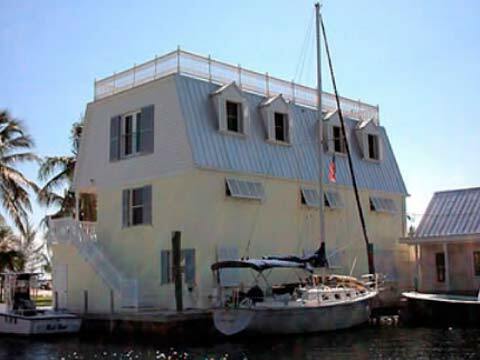 Tarpon Flats Inn and Marina a Florida Keys Bed and Breakfast. Modern accommodations with a Caribbean flair and elegance. The accommodations at Tarpon Flats take you back to the bygone Victorian era with a Caribbean flair. The pace is slower, in synch with the rhythms of nature. Each of our lovely rooms is furnished with British Colonial mahogany furniture, and each has a veranda view of beautiful Largo Sound and the State and Federal Parks that surround the most beautiful bed and breakfast in the Florida Keys. Our tastefully decorated rooms at Tarpon Flats bed & breakfast accommodate four comfortably in a four-post queen size bed and queen sleeper sofa. For your in-room entertainment all rooms have Satellite TV, VCR and CD-Player. The suites have fully equipped kitchens and the smaller rooms have kitchenettes, helping to make your stay more enjoyable at what we believe to be the finest bed and breakfast in the Florida Keys. Swimming, sailing and kayaking are available right outside your door,We are near several waterfront Restaurants and Tiki bars. Snorkeling and scuba diving in world renown John Pennekamp Park is just on the other side of Radabob Key. Directly across the Sound is some of the best bonefish flats anywhere. Head east out of Largo Sound through mangrove jungle creeks and then turn north taking in 15 miles of pristine ocean flats and lush untouched, protected coastline. Match wits with bones, snook and others. If you prefer photography, bring your camera and capture the sights of the remote back country of the Florida Everglades, eagles, herons, osprey and roseate spoonbill, just a 30 minute boat ride from Tarpon Flats.